Most of Jerome’s Issei and Nisei had strongly opposed their sons and brothers volunteering to go to war for a country that had denied them their constitutional rights, humiliated them and deprived them of their livelihoods. That year, 1943, only 31 of Jerome’s 1,579 eligible young men volunteered for the 442nd. Aki did not fault them for their feelings, but he was accustomed to making his own decisions and was determined to enlist, regardless of what others thought. George Aki was born in Livingston, California, on September 11, 1914, the second of three sons. He was raised in Fresno in the San Joaquin Valley, where his father, Kamesaburo, worked as a medical doctor in a hospital that served the area’s large Japanese community. The San Joaquin Valley has long been one of the richest and most productive agricultural areas in California, and Japanese immigrants were among its most skilled farmers. However, from the time they arrived in America in the late 1800s, the Japanese had been the target of state-sanctioned segregation laws designed by their neighbors to limit their success. In response to the apartheid-like prejudice directed against them, many turned to the Reverend Joseph K. Fukushima for guidance. Fukushima was a courageous minister with the Fresno Independent Congregational Church. He called for the members of neighboring white Congregational churches to follow their faith and denounce racism. Although not many did, Aki was nevertheless greatly influenced by Reverend Fukushima — so much so that he decided to become a minister. After graduating from Fresno State College with a degree in philosophy, Aki worked for the Fresno Parks Department to earn enough money to enroll at the Pacific School of Religion in Berkeley. While a student there, he met his future wife Misaki, who also was a student in Christian studies. Aki was 27 years old when Japan attacked Pearl Harbor on December 7, 1941. In a February 2011 telephone interview, the then-96-year-old retired minister recalled being stunned and angry by Japan’s action. He said he felt that his dreams of becoming a minister would never be realized. His worst fears seemed to materialize in February 1942 when President Franklin D. Roosevelt issued Executive Order 9066, which mandated the internment of all West Coast Japanese. George and Misaki Aki were taken to the Tanforan Race Track in San Bruno, California, along with 8,000 other Bay Area Japanese. There were denied any due process. And then a small miracle happened. One of the guards at Tanforan was a young man by the name of Ward Stephenson, who also had been a student at the Pacific College of Religion, although Aki did not know him well. Stephenson had dropped out of the school. Much to Aki’s surprise, Stephenson had arranged to pick up his diploma on graduation day and even stood in his place at the commencement program. Aki was so moved by this simple act of kindness by a white stranger that it reinforced both his sense of belonging and his desire to serve others. A short time later, the Reverend Robert Inglis of the Plymouth Congregational Church of Oakland defied the anti-Japanese hysteria of the times and recruited Caucasian clergy and laity from nearby churches and held a special ordination for Aki in the Tanforan dining hall. After four months at Tanforan, where Aki worked as a teacher and minister, he and Misaki were sent to the Topaz Relocation Center in Utah. However, because his elderly parents had been sent to the Jerome Relocation Center in Arkansas, George and Misaki requested and were granted a transfer to Jerome, arriving there in January 1943. It was a miserably cold place in the middle of a pine forest. 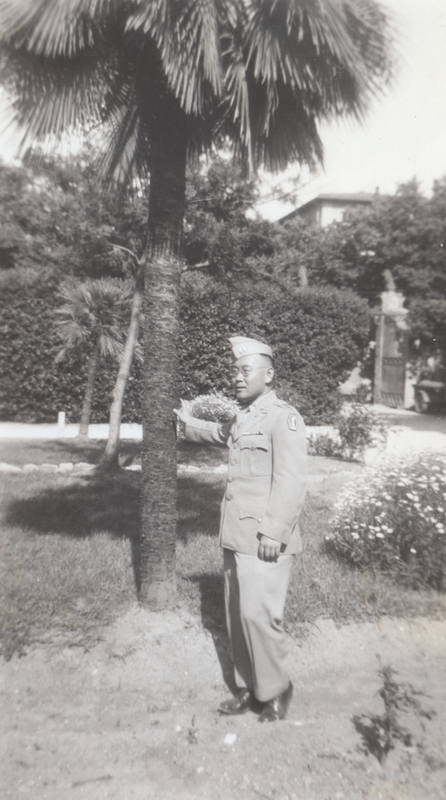 It was at Jerome a short time later that Aki met Chaplain Masao Yamada from Hawaii, who was training with the 442nd Regimental Combat Team at nearby Camp Shelby in Mississippi. Among the highest levels of the U.S. Army in Washington, D.C., there were questions about the loyalty of so many soldiers in the 442nd who practiced Japanese Buddhism. At the time, the Army had no provision for a Buddhist chaplain. Additionally, since the 442nd’s two chaplains — Yamada and Hiro Higuchi — were both from Hawaii, they realized also that the men from the Mainland would need someone with whom they could talk. Yamada recommended that the War Department commission a Mainland Nisei, specifically Aki, who he thought would be good for the men. The War Department concurred and Aki accepted the commission.